The first part of the publication contains an analysis of the latest FDI trends complemented by detailed methodological explanations. The analysis highlights the impacts of the recession on FDI in 2009. The main sources of data are the central banks of the individual Central, East and Southeast European countries. 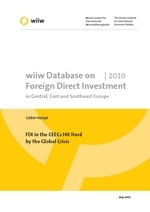 After a year of stagnation in 2008, FDI inflows to the CEECs halved in 2009. The decline in the NMS was even more severe while less so in the SEE countries. Still, FDI was more resilient to the crisis than other forms of foreign investment. In 2010 FDI may increase moderately in the region as a whole, with uneven development in the individual countries. Growing FDI inflows are expected in Poland and Russia, the largest countries in the region where also economic growth is bound to pick up. Declines are expected in countries with a drawn out recession such as Bulgaria and Romania as well as in several Southeast European countries. Foreign investors' income earned from FDI in the past is high but declining due to the crisis, and repatriated to a large extent. The income outflow may surpass the amount of new capital inflow, but this negative direct effect of FDI on the balance of payments can was offset by the foreign trade surplus generated by foreign affiliates. In 2009 the current accounts of several CEECs turned positive or ran smaller deficits than before which could be financed by FDI to a higher extent than earlier.